The lead ship Vasily Bykov will be removed from the slipway on June 15-16, 2017. It is planned to be floated out in late June. "After that, it will be brought to the docking basin. Then, its dock trials and the passage to the base will follow. Therefore, the acceptance of the ship by the Navy will be postponed to next year," the source said. 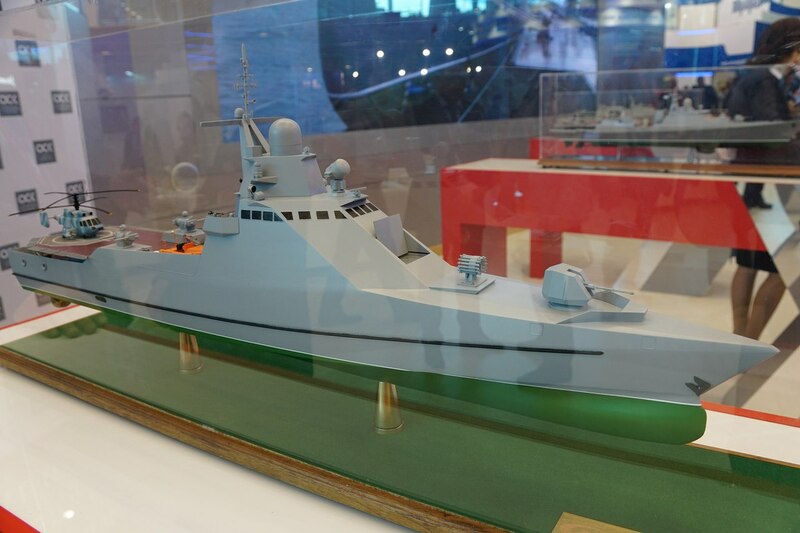 According to the source, the first serial-produced ship Dmitry Rogachyov will be accepted by the Navy virtually on schedule. Flotprom does not have any official comment from representatives of the shipyard. 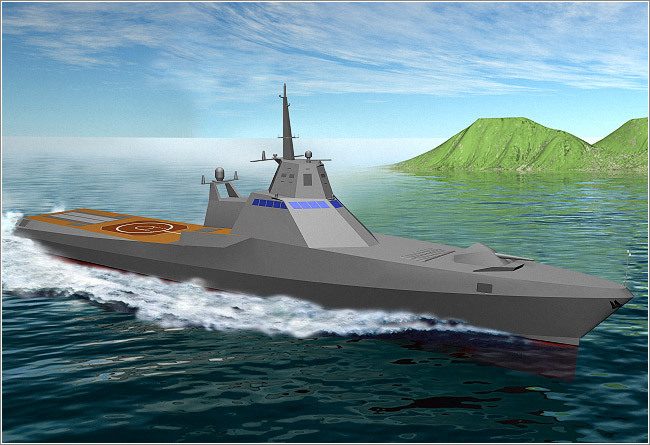 The Project 22160 ship is designed to protect territorial waters and patrol the economic zone. The Project 22160 patrol ship has a displacement of about 1,300 tons, a speed of up to 30 knots and a cruising range of 6,000 miles. Its cruising capacity is 60 days and its crew totals about 80. The ship is armed with the 57mm gun, an air defense missile system and machineguns. The ship can carry the Kamov Ka-27PS (NATO reporting name: Helix) helicopter. In all, Russia’s Navy is expected to receive six ships of the type before 2020. Google translate wrote: "Diesel-reverse gear unit DRRA6000 designed to operate at a fixed pitch propeller - told FlotProm to" Kolomensky plant "-. The composition of the main ship power plant design includes two units - DRRA6000 and DRRA6000-01 (each with a capacity of 6000 liters. c.), which are located on left and right sides of the ship. " 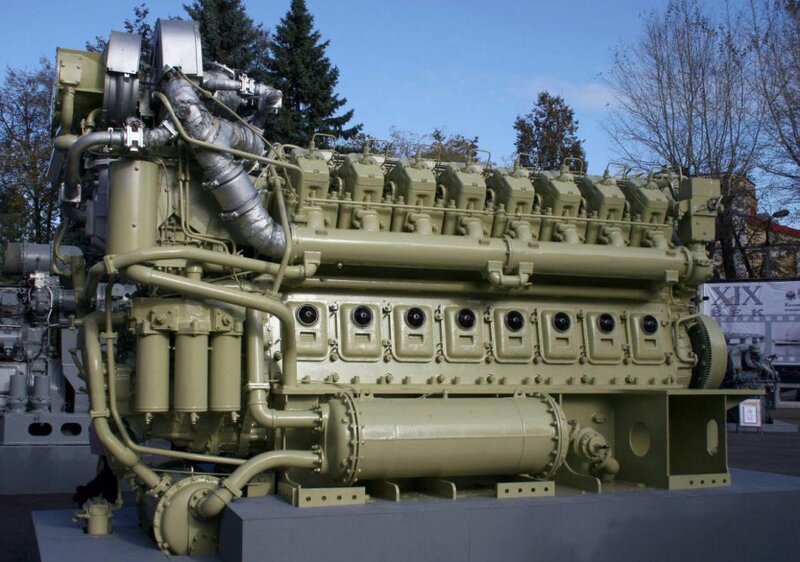 The enterprise added that each unit consists of a diesel engine built 16D49 "Kolomensky plant" reverse reduction gear manufacturing PAT "Star" and the local control systems of "Concern" NPO "Aurora". I think the first 22160 ship should be outside now. Any pictures of it? Well not sure why they would do that? maybe they thought to give Zaliv some experience with modern ships so they sent over a nearly finished hull or they wanted to get something going and fast so they moved it from the space. In anycase this explains the delays with the first ship. How could they move 90 m long unfinished ship from Zelenodolsk to Zaliv shipyard and no one notice it? Most probably it was built in Zaliv from the beginning. medo wrote: How could they move 90 m long unfinished ship from Zelenodolsk to Zaliv shipyard and no one notice it? Most probably it was built in Zaliv from the beginning. It was not, It's not hard to move something that large you just need the equipment and know-how, Russia does have both. Since I can speak Russian very well and read it, here is the translation. 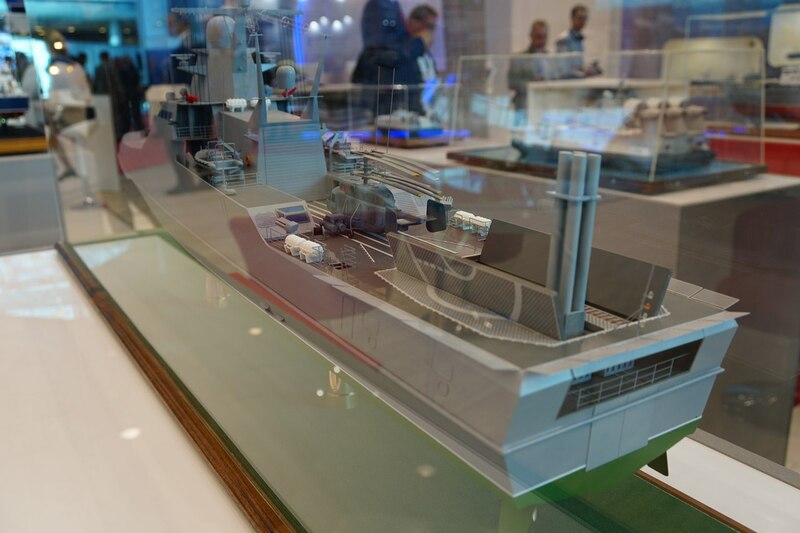 "In the Kerch company "Shipyard" Zaliv "goes the construction of patrol ship project 22160 of the number laid down in the last year in Tatarstan JSC" Zelenodolsk Plant. AM Bitter. " Previously, such a production co-operation has been used in the construction of cable ships of the project 15310 "Volga" and "Vyatka". On the neighboring stocks are under construction project of search and rescue vessel A163." I assume nobody was really trying to hide the transfer. People simply didn't think that there is anything unusual about large piece of metal being moved in and out of shipyard. Nice to see Crimea getting a slice of the action. the ship was moved in sections , several sections over a month period were moved on barges , section were horizontal on sides and covered , they were moved by volga- don rivers- then azov sea- and kerch , then sections were uplifted by cranes and welded , zaliv had problems with welders but new have came in and also zelenodolsk sent instructors with blueprints. I think this is good, Zelenodolsk has had so much stuff on, probably were running very low on space. Zaliv has space & a 22160 seems like a good boat to get up to speed on: modern, decent size but not huge, some system complexity but not too much. There is another one that has been moved to Zaliv (Kerch) as well. That is the SERGEY KOTOV. Zaliv is also building other auxiliary vessels for the navy. It is a very important and relatively large shipyard. They will get it up to speed. Believe I read that Zelenodolsk had purchased Zaliv and if so we should expect a lot more of this. 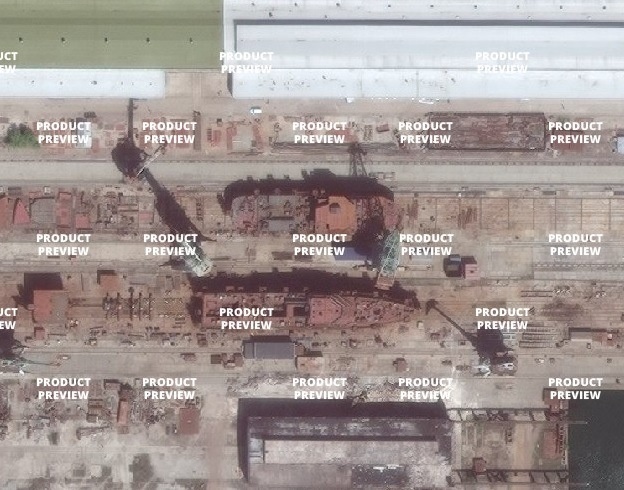 Judging by the published satellite photos from the resource TerraServer.com and the data on the purchases of LLC "Shipbuilding plant" Zaliv "in Kerch, this enterprise is actually building for the Russian Navy two patrol ships of project 22160" Pavel Derzhavin "and" Sergei Kotov "(factory numbers 163 and 164) Judging by the satellite image, the corps of the first of them was already very ready on February 28, 2017. Recall that both of these patrol ships were officially laid in February and May 2016 in Zelenodolsk, respectively And OJSC Zelenodolsky Plant named after AM Gorky (the enterprise is included in the group of companies of JSC Holding Company Ak Bars). Zelenodolsky Plant named after A.M. Gorky from the end of 2014 actually got under temporary management Kerch factory "Zaliv", and now transfers to the "Gulf" part of his orders. 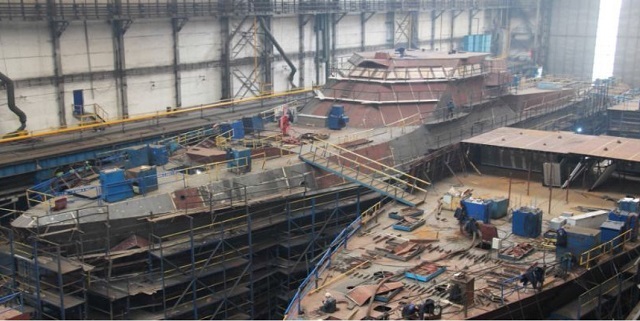 As already reported, the cable plant "Volga" and "Vyatka" of project 15310 are also being built at the Zaliv shipyard. These very large vessels (deadweight about 8000 tons, length about 140 m, width about 19 m) were ordered by the Russian Navy Zelenodolsk Plant A.M. Gorky, and their formal laying was held in Zelenodolsk on January 6, 2015. 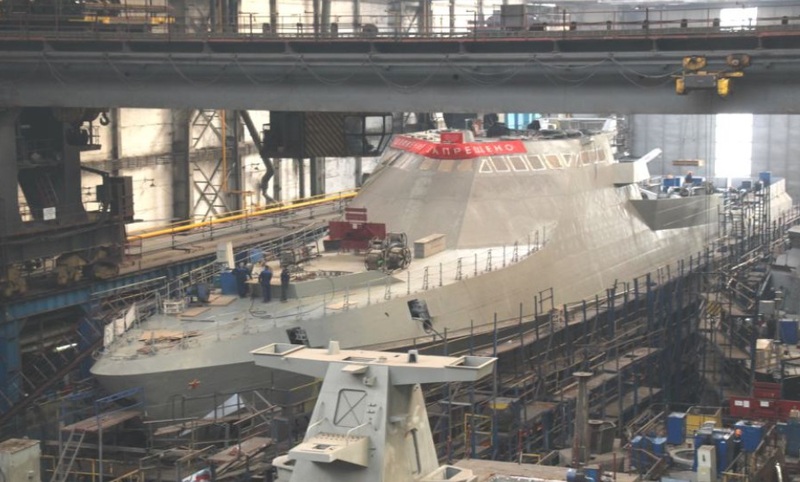 Also, according to available information, at the Zaliv plant, the small missile ship project 22800 (code "Karakurt"), which was called "Cyclone", and ordered without special publicity in Kerch in the summer of 2016, is being built up for Zelenodolsk plant. In addition, three small hydrographic vessels of the project 19910 with factory numbers 801, 802 and 803, laid in 2016 and early 2017, are being built at the Zaliv plant for the Russian Navy. Patrol ships "Pavel Derzhavin" and "Sergei Kotov" (factory numbers 163 and 164) are built under the contract of OJSC Zelenodolsky Plant named after A.M. Gorky "with the Ministry of Defense of Russia No. 1419187406982020105007328 / З / 1/1/0556 / ГК-14-ДГОЗ from October 9, 2014 for the construction of five serial patrol ships of project 22160 with the factory numbers 162, 163, 164, 165 and 166. 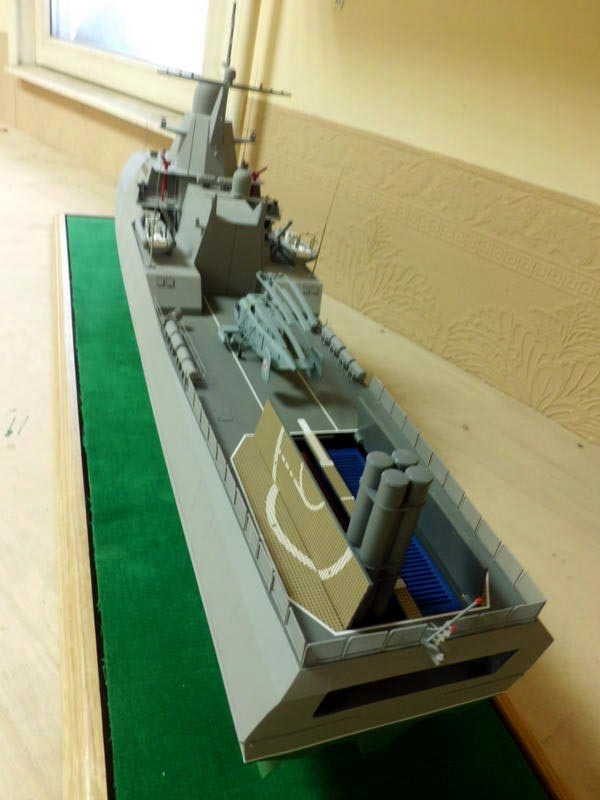 According to this The contract for the construction of the patrol ships Dmitry Rogachev (plant number 162, laid July 25, 2014) and Victor the Great (factory number 165, laid on November 25, 2016) was also started to the contract in Zelenodolsk. The time for delivery of ships with factory numbers 162, 163 and 164 - 2018, with factory numbers 165 and 166 - 2019, although it is not clear whether these terms are sustained. The head ship of project 22160 under the name "Vasiliy Bykov" (plant number 161) is built at OAO Zelenodolsky Plant named after A.M. Gorky "for the Russian Navy under a separate contract with the Russian Defense Ministry on April 11, 2014, although in fact it was planted at the enterprise on February 26, 2014. It was planned for delivery in 2017, but in fact, only now, as of August 2017, it is planned to launch it. 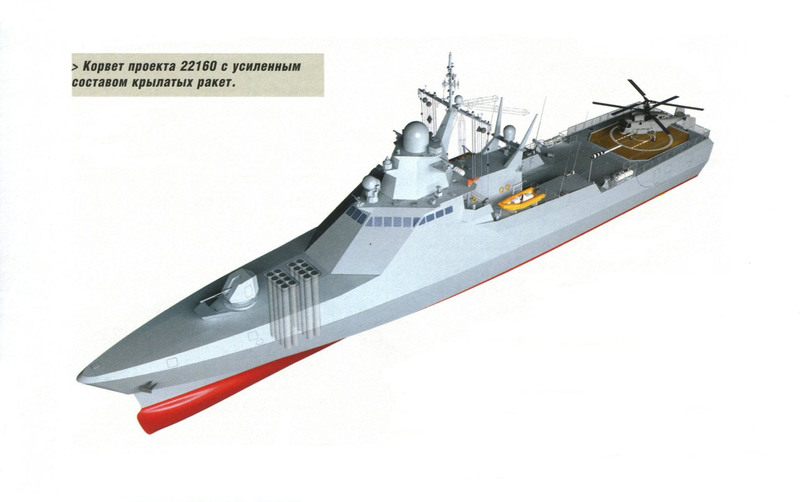 All six contracted ships of Project 22160 are planned for commissioning in the Black Sea Fleet. It has two Palash CIWS. Could it have proper torpedo launchers tucked away somewhere? And what is under that that retractable cover in the front? 1st picture- the towed sonar is now integral part of the ship. previously it was optional in a small container like uran container. also torpedo armament is larger -launch box covers are visible on sides. 2nd picture - the cover rotates - when its angled it keeps stealth , when rotates to vertical then redut SAM launchers are open to fire. 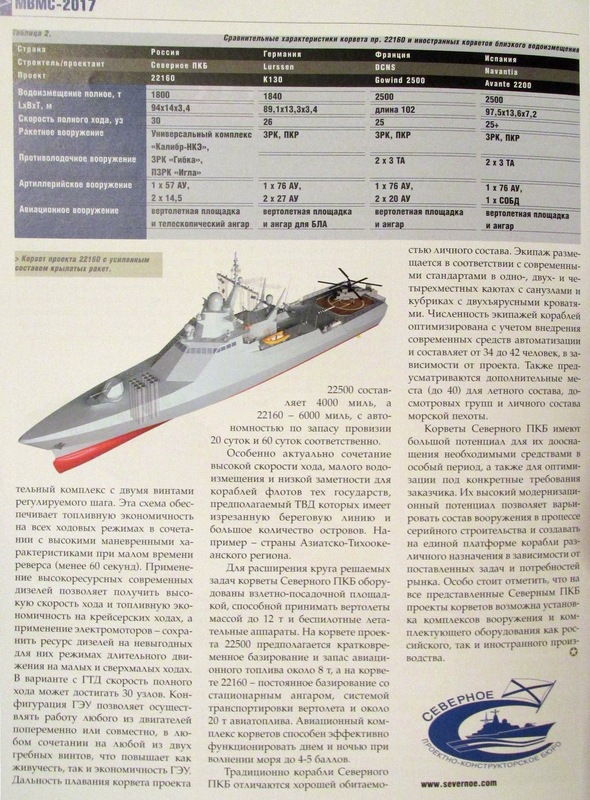 The model of the patrol ship Project 22160 is still somewhat far from reality. Nevertheless, it is worth paying attention to the compartment for modules and basing (models) of a full-fledged Ka-27 helicopter, rather than trifles like Ka-226. Somewhat confused is the fact that the helicopter is depicted in the "shock" (with the missile blocks on the suspension), rather than the anti-submarine version. Somewhat confused is the fact that the helicopter is depicted in the "shock" (with the missile blocks on the suspension), rather than the anti-submarine version. A better translation for that would be Attack helo rather than a shock helo. It is the Ka-29 assault helo... an armed troop transport helo that is quite comparable to the Armed Mi-8. Certainly a strange choice for a patrol boat as the 16 troops it could carry would take up a lot of bed space on a small patrol boat. Nothing unusual about helicopters. These are anti-piracy ships primarily and pirates don't use subs. Look long enough to be UKSK? An interesting theory from Balancer on how Shtil-1 option could work. 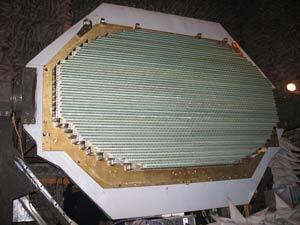 NIIP product page wrote: allows the SAM to simultaneously track 24 different air targets, with simultaneous firing for 6 of them. I believe this is actually a proper radar rather than just a continuous-wave illuminator so 4 of those with appropriate software/processing could provide 360deg tracking & fire-control. I seem to remember on some early prototypes for very small vessels with helos that they had retractable helo shelters to allow the aircraft to be worked on under cover in bad weather or cold conditions. Yes, my understanding is 22160 has one of those retractable hangars. I think this one is the IMDS model, has the 76mm gun. Photo is several months old.